The Australian Kangaroo Gold Bullion Coin was first introduced in 1987 with a design of the largest gold nugget ever found, the 2,284-oz Welcome Stranger nugget. These bullion coins became known as the Australian Gold Nugget. However, in 1990, the reverse design changed to that of a kangaroo, Australia's famous marsupial, giving way to the name Kangaroo Nugget. These designs change yearly but always feature the kangaroo. The coins come individually encapsulated in protective plastic covers to protect the finish. Each is made from .9999 fine (24 karat) gold with the 2011 versions scheduled to be struck in five different sizes - the massive 1 kilo, 1 ounce, 1/2 ounce, 1/4 ounce and 1/10 ounce. Mintage for each strike is limited, with the exception of the 1 kilo coin which will be produced to meet demand. As with the previous Kangaroo Bullion Coins, the Australian Government guarantees the weight and purity of each of these Perth Mint strikes. For reference, the Perth Mint recorded a relatively small 63,419 of the one ounce Gold Kangaroos sold in 2008. That number jumped to 298,012 in 2009 as the world was gripped by a questionable economy. 2010 figures were not yet available as of this posting. The obverse depicts a portrait of Her Majesty Queen Elizabeth II by Ian Rank-Broadley. Also inscribed is "ELIZABETH II", "AUSTRALIA 2011" and the face value of the coin. The reverse of the 2011 Kangaroo series features two different designs - one on the 1 kilo coin and another on the remaining four smaller sized strikes. 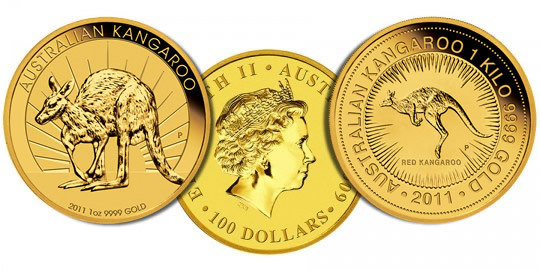 The 1 oz, 1/2 oz, 1/4 oz, 1/10 oz and 1/20 oz bullion coins contain a kangaroo superimposed over the rays of a rising sun. The 1 kilo coins depict a design by Dr Stuart Devlin, jeweler and goldsmith to Her Majesty The Queen, of a classic kangaroo.